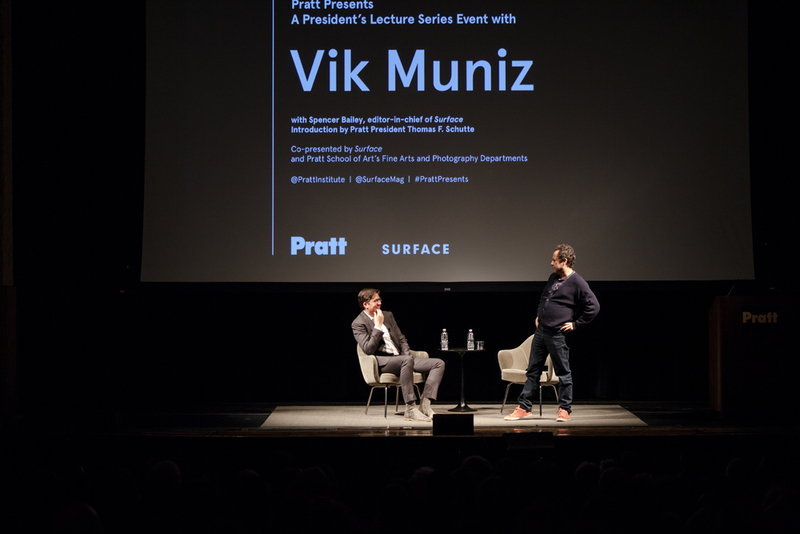 Last night at Pratt Institute, Surface editor-in-chief Spencer Bailey sat down with artist Vik Muniz to talk about dealing with criticism, the history of photography, and how art can change the lives of children. Over 300 guests were welcomed into Memorial Hall for the President's Lecture and Dr. Thomas Schutte, president of Pratt, introduced Bailey and Muniz himself, nodding to the artist's decades-long support of the surrounding Brooklyn neighborhood. Over the course of the evening, Muniz touched on many topics covering the full span of his career, going back to when he first left his native Brazil for New York City in the 1980s. "If you have a lot of prejudice about commercial art, you're just not living in the world," he remarked, noting the important role that his early career in advertising plays in the way he views his own work. The conversation moved on to Muniz's first major gallery show, why he chooses to work with materials like food and garbage, and how he sees art changing in the modern world. The evening ended with a short reception, allowing guests to meet Bailey, Muniz, and members of the Pratt community. You can watch the full archived livestream of the talk on Surface's Facebook Page. Thank you to the Pratt School of Art's Fine Arts and Photography Departments for co-presenting the evening.